There is very little that has not gone according to the blue print in 2014 as far as Prime Minister Narendra Modi is concerned. A hard task master yet charismatic, articulate yet carrying off a no-nonsense attitude to the hilt. He might have missed out on Time's Person of the Year, but many feel his time has come. There is very little that has not gone according to the blue print in 2014 as far as Prime Minister Narendra Modi is concerned. Apart from BJP's sweep of this year's general elections to the party's impressive performance in the assembly polls in Jharkhand and Jammu and Kashmir, Modi has also done no harm to India's image on the global stage. Here are some of the highlights from the year in which Modi truly came of age. 2014 General elections: The writing was on the wall after a pretty good showing by BJP in the 2013 Assembly elections and an equally woeful performance by Congress. However, very few would have predicted what actually followed. On 16 May, the day the results were declared, it was revealed that BJP won 282 of the 543 seats in the Lok Sabha, 10 more than what was required to form a government. Taking into consideration that the BJP-led NDA won 336 seats, the Congress were well and truly routed. It goes without saying that BJP's campaign was centred around prime ministerial candidate Narendra Modi. One could hardly get a sense of anything apart from a Modi-led BJP victory. Modi's US visit: Banned from visiting the country in the aftermath of the Godhra riots, it was highly ironical that Modi ended up being the leader to attract the largest number of Indian-Americans for a gathering in the US. Around 20,000 people attended Modi's speech at Madison Square. Soon thereafter US President Barack Obama accepted an invitation to be the Chief Guest for India's 66th Republic Day celebrations in January 2015. He will be the first American president to do so. Swachh Bharat Abhiyan: On 2 October 2014, the 145th birth anniversary of Mahatma Gandhi, Modi launched India's largest-ever cleanliness drive. The campaign was initiated at Gandhi's memorial Rajghat. About three million participants (government employees, school and college students) were part of the effort. Filmstars Amitabh Bachchan, Salman Khan, Aamir Khan and Hrithik Roshan, sporting personalities Sachin Tendulkar and Saina Nehwal, and politicians Arvind Kejriwal and Shashi Tharoor also took part in the enterprise. 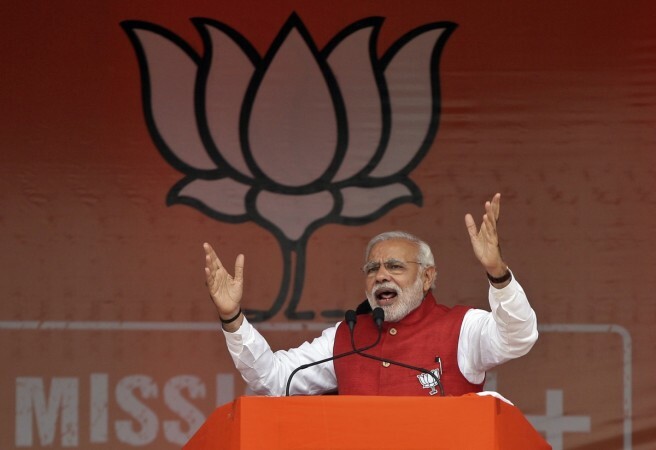 2014 Jharkhand, J&K assembly polls: Persistent campaigning by Modi in the two states did the trick as BJP has now been put in a position to form the government in Jharkhand having won 37 of the 81 seats. As far as Jammu and Kashmir is concerned, even though PDP got more seats than any other party (28), BJP finished a close second with 25, their best ever result in the state. One can also not undermine Modi managing to keep a relatively clean slate as far as controversies are concerned. While BJP and its affiliated parties have been shooting their mouths off on a regular basis with issues ranging from religious conversions to the construction of the Ram temple, Modi managed to keep himself distanced from it and maintained focus on the more relevant tasks ahead. While rounding up the year for Narendra Modi, one wonders what he missed out on in 2014? Was there any unfinished business which he was guilty of? A year in which he swept the masses off their feet, apart from elections and even the streets.